Two years ago, in April 2015, Sudanese President Omar al-Bashir – who assumed power in 1989 – once again won the presidential election. This further entrenched his personal hold on the politics of Sudan. He pledged in February last year that he would step down in 2020, but similar pledges were made in 2010 and 2014 – and he went back on his word. Al-Bashir’s longevity in office can be attributed to his ability to rapidly adapt to new situations, and to win over opponents through financial and political rewards. Is Sudan set to follow a long-term trajectory of continued instability – including ongoing warfare, a political stalemate, popular dissatisfaction and economic hardship – following the separation from South Sudan after a vicious 22-year civil war and the genocidal killings in Darfur? Or is there any hope for concrete change through a more representative form of government? As it stands, the situation in Sudan is making regional and external actors very nervous. Al-Bashir, 73, is in poor health, and spends a lot of time in hospitals in the Gulf. Officials report that his condition is not life-threatening, but it has clearly cut into al-Bashir’s energy to govern as before. He delegates much to his second-in-line, whom he trusts the most, Prime Minister and First Vice-President Bakri Hassan Saleh. Saleh has long been an al-Bashir ally, and helped him to root out opponents. This is a serious matter, as succession will be complicated by factional politics within the key pillars of the government, which are less united than before. Al-Bashir also faces other challenges, with a deepening crisis in the diminished economy and further drops in the value of the Sudanese pound. He further has to confront the paralysis of the government’s key pillars, including the ruling party, the National Congress Party (NCP). The NCP is in bad shape, as its high-ranking cadres have begun to question al-Bashir’s decisions in unprecedented ways. Actual power is concentrated in the hands of the National Intelligence and Security Service (NISS) and the military. Al-Bashir has managed to keep an uneasy balance between the two institutions. The NISS has become the most potent instrument of the government, having its own parallel paramilitary formation. Moreover, the government is dominated by military officers who either hold key ministerial posts, or oversee decisive ministries and local government offices. Al-Bashir makes sure that the officer corps is divided, and that certain personalities are systematically rotated out. This is done to prevent officers from building a support base, and to reduce the risk of a coup d’état. Nonetheless, there is nothing to stop middle-level and junior-level officers from considering staging a coup and establishing a new government of populist inspiration. However, al-Bashir’s government is not about to collapse – mainly because opposition forces, which hold widely differing political views, remain weak. The opposition is divided; and their best hope at present is for a more open political process. The NISS ensures things stay that way through arbitrary detention and enforced disappearance, making a speedily negotiated and consensual solution less likely. In a new pragmatic world where the West is unable to solve everything, al-Bashir’s government is adept at covering up the cracks in its opaque power structure. And it’s proven to be resilient, successfully weathering internal power struggles and popular uprisings alike. A profitable alliance with the Gulf offers further support, as do friendlier realignments in the Horn of Africa – where other countries like Ethiopia and Eritrea are offsetting one another. 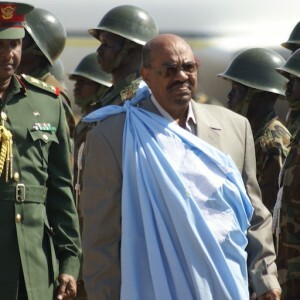 Al-Bashir wants freedom from the International Criminal Court’s indictments. The West has offered other incentives, including constructive engagement from the European Union (EU). Indeed, the EU struck a deal with Sudan mainly to reduce the unimpeded flow of migrants. United States sanctions were also eased earlier this year. Al-Bashir’s government has become known for meting out half-hearted measures, and using violence while resisting reforms. Whether incentives could moderate this behaviour remains to be seen. It is clear that substantive changes are needed, and urgently. Such changes should primarily transform the current, personalised structure of political power and the mechanisms through which it is exercised. They should also address deep-rooted problems and long-harboured grievances that have resulted from discrimination and neglecting key development sectors. It is hard to do this within a government which developed, over 28 years, a complex and corrupt web of tribal and economic patronages; and managed along the way to alienate key constituencies. These groups resent its narrow geographical focus, absence of vision and repressive tendencies. The other urgent priority is to end the armed conflicts, which have been costly both in lives and essential revenues lost. This could be a much-needed starting point to open up the political space to more constructive dialogue with the opposition, which ought to be integrated in Sudan’s society and restructured institutions. With such measures in place, prospects for true change could emerge on Sudan’s political horizon. In South Africa, Daily Maverick has exclusive rights to re-publish ISS Today articles. For media based outside South Africa and queries about our re-publishing policy, email us. You can also subscribe to specific topics. Get the ISS Weekly to stay ahead of Africa’s human security challenges.